Despite a fine cast, I have a bad feeling this is too full of romantic comedy cliches for my blood. I'm hoping I'm wrong. Tediousness and over-wrought, tired clich�s are only a few of the qualities that practically define the modern-day romantic comedy. Unfortunately, it seems like such qualities have recently reared their heads in similar fare overseas, and it can all be traced back to the surprise success of Mike Newell�s 1994 film Four Weddings and a Funeral. Plenty of other, light-hearted, yet by-the-numbers rom-com fare has followed through the years (Hugh Grant made a career of these films), with the latest being the barely-released 2011 film, The Decoy Bride. IFC Films brings it to Blu-ray so all of us, stateside, can see if this is more of the same, derivative fluff, or a pleasant surprise. Katie Nic Aodh (Kelly MacDonald) is returning to the small, Caledonian Island of Hegg, which is mostly populated by older folks. While this might not seem like the ideal place for a young, newly-single woman to meet a man, she soon finds herself in the middle of a pop culture spectacle. It turns out that James Arber (David Tennant), the writer of a hugely popular book, is about to marry actress, and tabloid favorite Lara Tyler (Alice Eve). When they failed to pull off their marriage in a large, European cathedral, thanks to the indiscrete antics of paparazzo Marco (Federico Castellucio), Lara moves the festivities to Hegg. It doesn�t take long for the paparazzi to get wind of the change of venue, but it�s going to be tough for the wedding to take place, even in Hegg, since Lara has gone missing and Katie and James are confined to a room together. Those of you judging this proverbial book by its cover, and looking for your every-day British rom-com, are going to come away extremely satisfied. If you�re looking for anything fresh, new, and exciting, however, you�re not going to get that in The Decoy Bride. Still, the film is surprisingly entertaining, yet never laugh-out-loud funny, and it moves at a brisk enough pace to make it a recommendable, albeit fleeting �date movie.� This is the epitome of fluffy, safe, inoffensive comedy, but I still couldn�t look away, despite my penchant for doing so during such films. 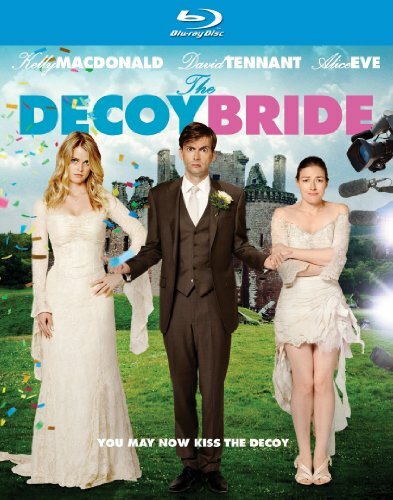 The Decoy Bride�s strongest quality is its cast, powered mostly by Tennant�s incessant charm. He�s best known for Doctor Who, but recent juicy roles in the Fright Night remake, and here in The Decoy Bride, exposing Tennant to a wider US audience. MacDonald has also gained a wider, domestic audience recently, thanks to her work in Boardwalk Empire, and she does a fine job holding her own with Tennant when they share the screen. Also, the focus on the ridiculousness of the paparazzi grows tedious after a half hour or so, but that storyline is kept afloat, for a while, at least, by the great work of Federico Castellucio as Marco. He plays an even larger role by then end, as well, which also finally gives Alice Eve something to do with her Lara character, which, for some reason, is totally underutilized, despite being one of the story�s three main characters. Still, despite that, and some other misuse by the director, this is a much stronger ensemble than originally expected. IFC Films limit quite a few of their better, Blu-ray-worthy films to DVD-only releases, but for whatever reason, The Decoy Bride gets the HD treatment. It looks quite good, though, thanks to a 1080p/AVEC-coded transfer that presents the film in 2.40:1 anamorphic widescreen. The transfer is problem-free, with beautiful colors, sharp images, and well-handled contrast throughout, with no dirt, grain, or edge enhancement to speak of. The DTS-HD Master Audio 5.1 lossless track is surprisingly enveloping, thanks to great usage of the surround channels, and even some nice low-end bass during a few sequences. The dialogue is always crisp, easy to understand, and is perfectly blended into the overall mix. The extras include a whopping 44-minutes worth of interviews with various cast and crew members, during which they talk about all aspects of the production, including how they got involved in the project initially. There�s also 12 minutes of on-set footage that gives us a great look at what actually happens on a film set, and on location, to boot. A 30-second deleted scene is up next, followed by almost two minutes of �FX Shots,� and the film�s trailer.